After 10 years as pastor and 20 years in the ministry, Pastor Nebrasky is leaving St. James. The St. James Christmas Tree Lighting ceremony is this Saturday December 11th at 6:00pm. 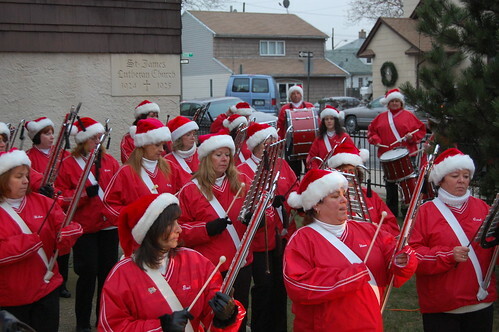 Just a reminder there is the Gerritsen Beach Property Owners Association Christmas tree lighting this Saturday. Rain Date:Sunday, December 6th ~ 6 p.m.
It’s that time of year again. Time to purchase your wreaths for St. James! 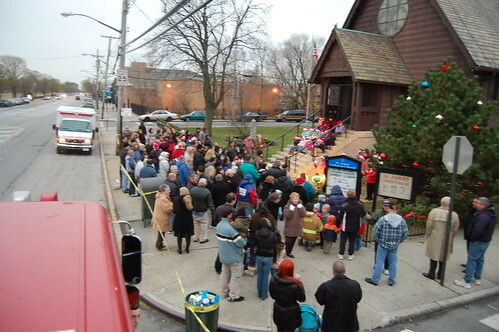 Saturday December 6th was the community tree lighting at St. James Church on Gerritsen Avenue. Last night was the last Property Owners meeting of 2008. There are a few others that I missed. The St. James Christmas Tree Lighting ceremony is this Saturday December 6th at 6:00pm. This year it will be a real tree in the courtyard! Which is awesome. Picture of the Week – What’s she thinking? Because the AOH sold the property that contained the traditional Christmas tree, this year’s tree lighting ceremony was held at St. James on Saturday, December 8. It was also moved to 4 pm because no one was sure about what time the new solar-powered Christmas lights would go on. The Property Owners asked Pastor Nebrasky if they could use St James as the location for this year’s ceremony. St. James and the pastor were more than happy to allow the community to use the yard. However, since the AOH display was elaborate and involved many lights, there was a concern that the electricity load would be too much because of the age of the church. The Property Owners found a solution to the problem: solar-powered Christmas lights. They bought 6 strands of multi-colored 100 LED at $80 each. On Saturday a group of volunteers helped to put up the lights and sponsor wreaths. Jane O’Flaherty, Donna Davis Cathy & Terrence Shea, Bob Banham, Janet Behrens, Danny Smith, and Kevin Howard were among the volunteers. At the ceremony Lilybeth’s Little Big Players sang Christmas songs and the Gerritsen Beach marching band played some songs as well. Lew Fidler, Marty Golden, and Alan Maisel were all there to wish Gerritsen Beach a happy holiday and then went downstairs in the church to have some hot chocolate to warm up from the cold.